This post was written by guest author Jeff Zhao. AUSTIN, TX — The best college women’s teams in the South Central region descended on Austin two weekends ago with aspirations of earning bids to the D-I College Championships. #14 Colorado Kali managed to upset hometown heroes #1 Texas Melee in the final 12-11, earning Colorado their third consecutive regional title. Colorado Kali looked sharp throughout the weekend, easily winning their pool on Saturday while giving up a total of 15 points in four games. On Sunday, they again came out hot, jaunting through a 15-2 semifinal trouncing of Kansas to set up a shot at another regional title against the #1 team in the country, Texas. For much of the final, the teams traded tough points, with the game defined by Kali’s trademark tight person defense. 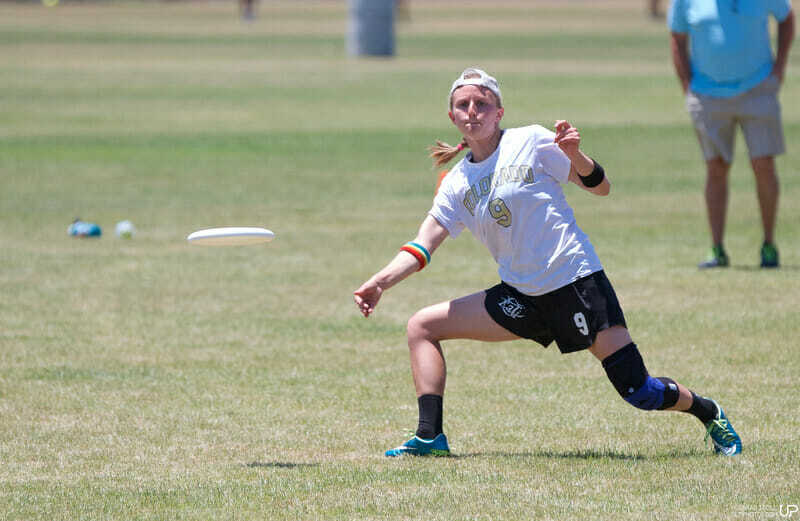 Fiona Dragonfly’s defense inspired Colorado to step up throughout the game, and collectively their responsive defense on strike cuts stuttered the typically confident Texas handler flow. The teams stayed close through halftime, before Melee finally broke late to go up 10-8 at the cap, building a formidable lead in a game to 12. But Kali immediately roared back with three straight scores and pulled ahead to lead 11-10 with a scoring bid in the endzone. In response, Melee’s Domenica Sutherland picked up the pull and fired back with a perfectly placed backhand huck to Julia Schmaltz to tie the game. Double game point was a messy affair with four sloppy turns before a well-placed flick huck from Kirstin Johnson to Nhi Nguyen gave Colorado the score and the win. “We really just trusted in our captains to be able to get our team in the right mindset and they’ve been doing that all year with a lot of [weirdness] and a lot of positivity, so it really was them leading the way,” added assistant coach Lauren Boyle. Colorado fifth year Leilani Nelson had her best game of the season, while Kali stalwart Kirstin Johnson put in solid work as a go-to handler and Kelsey Bennett had a terrific upline give-and-go move to score. Despite being exuberant over their win, Kali admitted they weren’t sure they could beat such a tough opponent. This was Colorado’s first comeback win of the season. By clutching it out, they’ve shown they have what it takes and if they can ride this momentum into Nationals, they’re a serious threat. Texas has an arsenal full of tremendous weapons and is clearly still a contender to win the national title in Cincinnati next weekend, but they have at times struggled against elite competition this spring, going 1-3 in tournament finals. When Texas gets going, they look unstoppable. With eight players playing elite women’s club with Texas Showdown, they possess a unique level of chemistry, experience, and confidence. Player of the Year candidate Julia Schmaltz is an obvious problem for teams when she’s on offense, but she’s also an unsolvable quandary for opponents on defense, where she’s constantly threatening the deep space. Gabby Cuina had a terrific final, playing through contact to get endzone skies, blocks, and even a Callahan to take half. Shiru Liu was everywhere on the field and proved indomitable for her matchups all tournament, shrugging off a busted lip and numerous sprawls on the field. Rounding out the list are the usual suspects: Dre Esparza deftly distributing the disc, Laura Gerencser reliably extending flow sequences, and Domenica Sutherland being the rock of the D-line. Unfortunately, this brilliance is sometimes inconsistent, and it showed in the final. Melee occasionally struggled to keep up their defensive pace, as their four-person cup set had some difficulty keeping up with the confident Kali disc movement. Despite scoring on some amazing plays, there were a few too many turns off throwaways and drops to cutters coming under. On double game point, Esparza opted for a offhand high release backhand — instead of her reliable mark-breaking backhand — which got caught by the wind and flew backwards for a turn. Melee began both of their double game point offensive possessions with a swingless Sutherland huck deep. While she’s a reliable deep shooter, in an upwind, high-pressure setting, it created issues. Coach Edith Teng didn’t mince words: “I think we’re just making mental mistakes, just people making bad decisions under pressure. We’re not a team that normally does that. This is a team that, when it’s playing well, is certainly capable of being the best team in the country. In discussing the final, Teng also highlighted standout performances by rookies Caroline O’Connell and Anna Smith. After this season, Texas Melee is certainly no stranger to the thrill of victory or the agony of defeat. They’ve come off every prior defeat looking better, and they’ll no doubt tear into Nationals with a vengeance. Colorado College Strata came into Regionals with the serious intent to knock off a favorite and snag a Nationals bid. Coming off the 15-12 semifinal loss, Colorado College pushed all the way through the backdoor bracket to see Texas again. In their first backdoor game, they initially struggled to find a rhythm upwind, but with the direction of Lew, they gained some traction and outlasted Colorado State in a tight double game point game. In the backdoor semifinal, they played a resilient Washington University team and pulled away in the second half to win. In the game-to-go, they faced Texas once more. Texas came out hot after their loss to Colorado, and they ultimately outscrapped Strata. Though the score wasn’t as close as their semifinal match, Strata fought hard through until the last point, losing 5-15. The team recognized exceptional efforts all season by Robin Fassett-Carman (“No one wants it more than her”), Monica Weindling (“Our best thrower”), and Annie Brewster (“Not here due to a concussion, but the heart and soul of the team”). #22 Colorado State Hell’s Belles’ Nationals hopes ended with their loss to Colorado College in a windy game on Sunday. Throughout the game, Colorado State’s strong handler corps had no hesitation flowing downfield or shooting deep once they broke the first line of Strata’s zone. Handler Kiera Lindgren spent the weekend cutting instead of handling, while Danielle Reimani and Kaci Cessna picked up the handling load without issue. Kat Killingsworth was a consistently reliable cutter option and Erin Berg laid out on everything against Strata. Unfortunately, it was not enough, as Hell’s Belles fell on double game point, 11-10. Despite coming into the tournament with only 12 players due to school finals, WashU managed to upset Kansas 12-9 in the backdoor bracket, exceeding expectations and finishing fourth in the region. As a team, Iron Horse pride themselves on being coachable, on working hard, and on fighting for each other. They’re a meat-and-potatoes team: they play horizontal stack, taking shots deep whenever possible. They have a zone look or two, but they go back to person if the opponents’ handlers get cute. They finished riding high, excited about their peaking performance, which they hope to establish as a new baseline. Performances of note came from captain Nora Shevick, who put the team on her back and played every point in the bracket but three. Sylvia Snyderman was a consistent playmaker and Jackie Weiss got a lot of endzone blocks, especially against Kansas. If they keep winning over well-known programs like Kansas, perhaps a return to former glory is in the future for Washington University. Kansas was clearly disappointed in finishing fifth and missing Nationals this year, with some players collapsing on the field after their loss to WashU. They came in with high expectations and took it easy in a 15-2 semis drubbing at the hands of Colorado in order to aim for a bid through the backdoor bracket. Unfortunately, they stumbled against WashU and were unable to replicate their 13-3 pool win over Iron Horse. Kansas demonstrated a supremely confident handler set between Callahan nominee Clare Frantz and captain Jordan Alonzo, moving the disc and their feet quickly. These women overwhelmed lesser defenses, but it wasn’t enough to get them to Nationals this year. Comments on "South Central D-I Regionals: Tournament Recap (Women’s)"